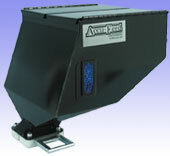 Shown is the Split Lid Hopper for our Mini-Feeder. It holds approximately 17.5 pounds of concentrate (1/2 cubic foot capacity). For loader applications there is a hopper available with a No Leak Cover. Also available is a Drying Hopper.